As Benjamin Graham famously said about investing, "In the short run, the market is a voting machine, but in the long run, it's a weighing machine." When the market gets into "voting machine" mode and decides it doesn't currently like a company, it can turn out to be a fabulous time for investors with a longer-term time horizon to buy that company's shares. With that in mind, we asked three of our contributors to search the market for large-cap stocks that look like they may have gotten inexpensive enough to be worth considering buying now. They picked Activision Blizzard (NASDAQ:ATVI), Facebook (NASDAQ:FB), and Cigna (NYSE:CI). Read on to find out why. Daniel Miller (Activision Blizzard): If you're looking for a top large-cap stock right now, a good place to start is the gaming industry. Starting last October, Activision Blizzard's stock declined sharply and has since hovered far below its $84 52-week high. A perfect example of how volatile the industry can be was last year's hit Fortnite that seemed to appear overnight and generated roughly $2.4 billion in revenue during 2018. Fortnite had enough of an impact for Activision Blizzard to post 2019 revenue guidance of only $6.3 billion, compared with 2018's $7.26 billion net booking mark. If investors can accept that 2019 will be a transition year for the game publisher, its business could rebound in the years ahead as it doubles down on mobile and on esports. Its Overwatch League boasts 20 teams and is the world's first major global esports league with city-based teams, and the company's number of monthly active users could jump over the next few years with a push to mobile that includes launching Call of Duty Mobile. Keep in mind that most gamers in megamarkets such as China and India use mobile as their preferred platform, and the company's Asia-Pacific segment generated only $1 billion of the company's $7.5 billion in net revenue last year -- leaving plenty of room for growth, as China's total game industry alone was worth $34 billion last year. 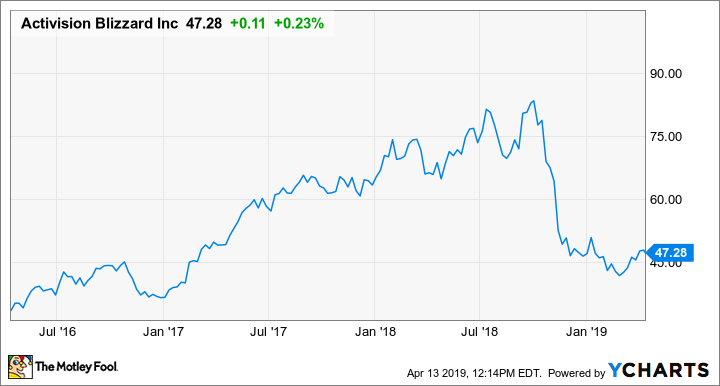 Nicholas Rossolillo (Facebook): Shares of social media juggernaut Facebook are now up 36% so far in 2019, erasing the steep losses suffered last year. However, Facebook's stock is still nearly 20% off its all-time high that it reached last summer before the tidal wave of negative press and questionable data practices sent the company's valuation into a tailspin. The rebound could pick up more steam, though. In spite of Facebook's woes, growth has continued. Monthly active users increased 9% year over year to 2.32 billion during the fourth quarter, and revenue and diluted earnings grew 37% and 40%, respectively, in 2018. Though expansion of active users is likely to continue to slow further into the single-digit range, sales are still going at a strong double-digit clip. With a 12-month forward price to earnings ratio of 20.1, Facebook looks like an attractively priced growth concern. Granted, many investors have been gun-shy because of the massive spending at Facebook to crack down on abusive and other problematic content on the social network. The company is also keeping its foot on the gas to promote other features like Instagram Shopping. As a result, the executive team has said expenses in 2019 should balloon 40% to 50% higher. That's sure to keep a lid on a repeat of the stunning earnings growth the past few years. Nevertheless, this social empire is still very much in sales growth mode and has proved it has real staying power with internet users even in the face of scathing criticism. With shares still working off the effects of extreme pessimism from 2018's PR nightmare, now is a great time to buy ahead of first-quarter earnings due out on April 24. If you're expecting the future of a company to go to $0, you put a much lower multiple on its future than you do if you expect its operations to hold steady or grow. Nervousness among investors has knocked several health insurance companies for a loop, which means now is a great time to consider buying if you believe their futures are anything by dire. Cigna in particular looks like a potential value, trading at less than 9 times its anticipated earnings and near its 52-week low. Despite the political risks, analysts are projecting its earnings to increase at around a 14.5% annualized rate over the next five years. If its operations just hold steady at its anticipated 2019 earnings, its shares look reasonably valued. If its growth turns out to be anywhere near what analysts are expecting, the company's stock looks like a downright bargain.